Clemson Girl: Get Tickled Orange this weekend – and get 10% off! Get Tickled Orange this weekend – and get 10% off! Most of you are probably familiar with TigerTown Graphics – it’s been in business in Clemson for over 20 years designing t-shirts of all varieties. Well, a little over a year ago, the owners of Tiger own Graphics realized that a lot of their Clemson Girl clientele was looking for more “girly” Clemson stuff when shopping in their store. So in April of 2008, the owners of TigerTown Graphics (3 men) opened up a new store in downtown Clemson called ‘Tickled Orange’ and handed it over to the experts of all things girly and Clemson….their wives. Monogramming – Tiger Town Graphics has its own embroidery department, so pretty much anything you get at Tickled Orange can be custom monogrammed in-house! They are licensed to stitch the official Clemson tiger paw, and will print monogram stickers and license plates also in-house. Little Clemson Girls’ Apparel – Tickled Orange also carries the cutest kids’ Clemson outfits and gifts, including adorable smocked orange or purple gingham dresses and shortalls – which can be monogrammed with your little one’s initials or with a Tiger Paw. How adorable is this cute orange and purple dress pictured below? Your little Clemson Girls want to be comfy on gamedays too. 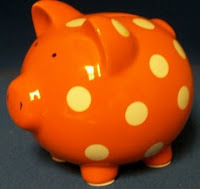 :) And teach your little ones the lesson of saving money at an early age and get them this too cute orange and white piggy bank! I want one! Gameday Jewelry – And of course any gameday outfit is not complete without the perfect gameday jewelry. 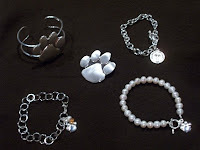 Tickled Orange carries a wide variety of jewelry: orange, purple and white shell jewelry, pearls, sterling silver Clemson jewelry, bangles, necklaces, earrings, etc. They even offer unique, custom handstamped jewelry. This would make an awesome gift (hint, hint to my friends reading this). 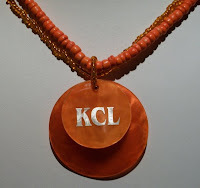 Get an orange shell necklace with your initials stamped on the pendant. Gifts, gifts, and more gifts - You can find a wide variety of really fun gifts at Tickled Orange that would be perfect as graduation gifts, tailgate gifts, Christmas gifts… any occasion really. They have hand painted glasses, koozies, market tote baskets, shower wraps, original Clemson ornaments and much more, all very reasonably priced. I know Christmas is still three months away, but I think I am going to have a Clemson Christmas tree (in addition to my normal tree) that’s decorated with orange lights and Clemson ornaments. 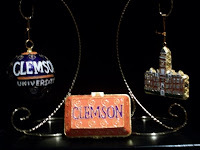 The ornaments pictured below would be a perfect start for my Clemson tree – is anyone else already doing a Clemson Christmas tree? Send us pictures! Handbags, Luggage Sets, Wallets – Of course Tickled Orange carries a variety of handbags and purses that compliment any gameday outfit… but check out these awesome wallets! 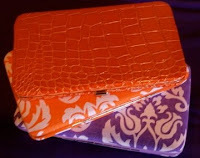 A while back a few ladies posted on our Facebook page that they were interested in finding some orange and purple wallets – well.. I think these will do perfectly! And Clemson luggage? Am I dreaming? Love it! 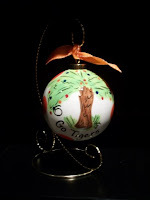 Sorority Gifts – When I was at Clemson, we ‘monogrammed’ items ourselves with paint pens as sorority gifts – and they were…well… the best option we had at the time – leaving much to be desired I’m sure. I think the painted letters were either chipped off or washed off within months. But now sororities have so many options for their Big Sis or Lil Sis gifts – especially at Tickled Orange who carry a TON of Greek lettered, sorority gifts. Tickled Orange can monogram sorority letters on just about anything they carry – but they also carry really cool Greek lettered items like frames, photo albums, and the lip balms and lip glosses pictured below. So are you ‘tickled orange’ after reading this post? I can’t wait to get in there and do some shopping! Make sure you stop by this weekend and check them out. And they are open on Sundays especially for home football weekends – so if you can’t make it on Saturday, stop by on your way out of town. 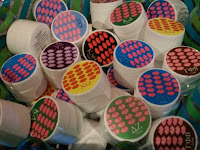 You can also find them on Facebook and become a fan to keep up to date on all of their latest and greatest new items. SPECIAL OFFER FOR CLEMSONGIRL.COM READERS!! 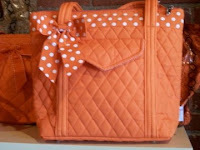 Visit Tickled Orange and mention you found them on ClemsonGirl.com and get 10% off of your total purchase! And tell them thank you while you’re there for thinking about all of us Clemson Girls! Thanks Tickled Orange!